When Spot Cool Stuff travels with an iPod we always have it in a waterproof case, whether we plan to being near water or not. A case that protects an iPod from water also protects it from sand (which, we suspect, is a more common cause of iPod mortality than water is) and from everyday dust and grime. A good waterproof case will also protect an iPod from knocks and dings. Not all waterproof iPod cases are created equal. In fact, most are inferior. Some are little more than glorified zip-lock bags—they’ll work okay at first, not so much after a few months. Other cases are prone to accidental opening, provide an obstructed view of the screen or make operating the iPod cumbersome. 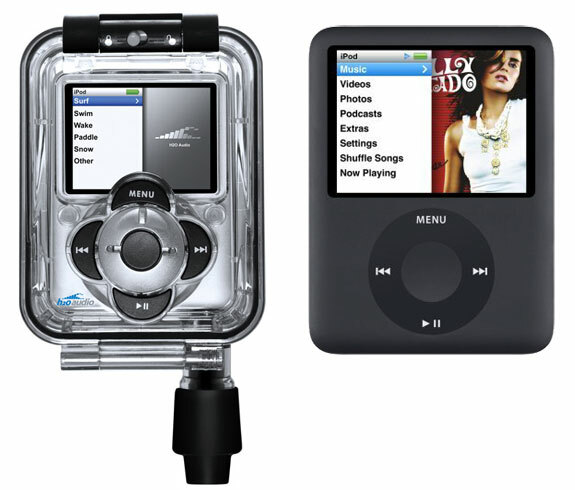 Our reason for selecting the Otterbox Armor as the best waterproof case for a 4th (and latest) generation of iPod Nano can be summed up in one word: durability. This Otterbox case is not only made of a hard plastic but its interior siding is lined with shock-absorbing rubber. We’ve dropped an Otterbox Armor-encased Nano off of a table onto a hard tile floor several times without any damage to the iPod. (The case itself, though, got rather scratched up). Normally, we prefer for the iPod controls to be replicated outside the case but the Otterbox Armor doesn’t decrease the sensitivity of the trackwheel too badly. The case comes with a removable neck lanyard and belt clip. 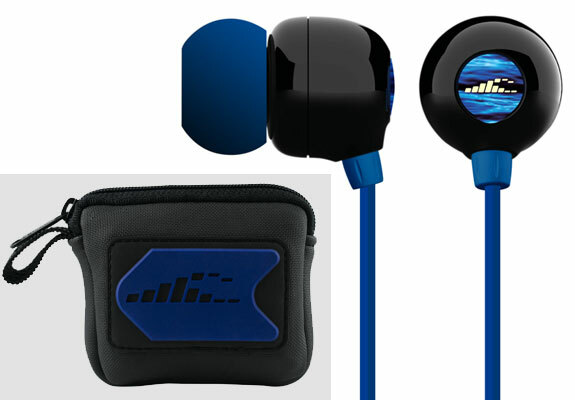 We love the selection of high quality iPod accessories from H2O Audio. Their iN3 case is the best for the 3rd generation of iPod Nano. The case’s coolest feature is that the iPod control buttons are replicated on the outside. 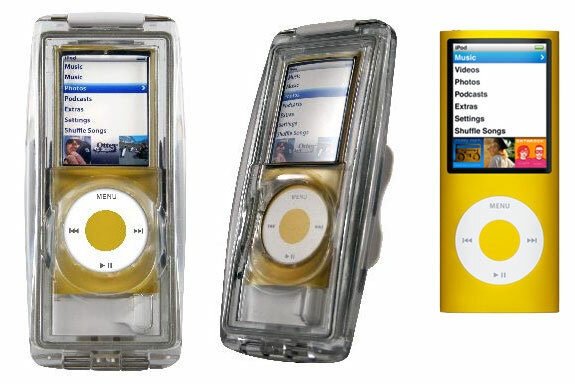 (Models from other companies typically require you to operate the iPod through the case). We also like the impact resistance this case supplies and that it comes with a sport armband and removable belt clip. 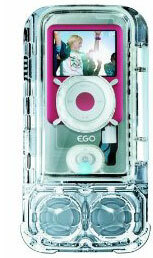 If you want an iPod Nano 3G case that also holds a pair of speakers then eGo has you covered. These speakers are not stellar and do not get particularly loud—if you are hosting a pool party you’ll want a “real” stereo. If you want speakers that are highly portable and come at a low price then the iceBar 2 is perfect. The case comes with a little flip-out stand to keep the speakers upright. Four AAA batteries will power the speakers for up to 24 hours. 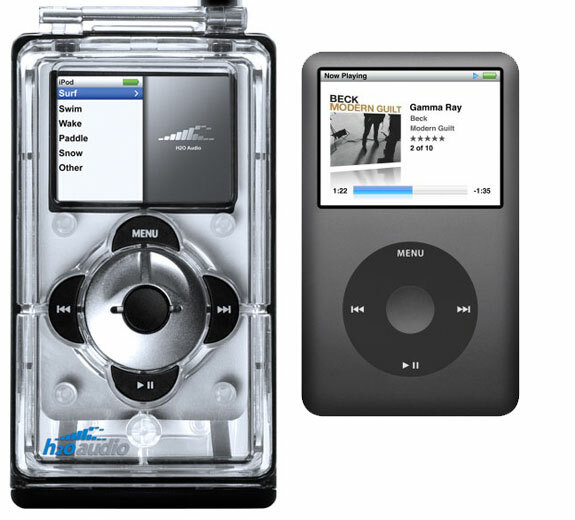 Everything we wrote about H2O Audio‘s iN3 case (above) applies to their iV6 case, which fits the 6th (and latest) generation of iPod Classic. Like the iN3, the iV6 is a cool-looking product that has the advantage of having the buttons replicated on the exterior of the case. And, like its iN3 cousin, the iV6 case comes with the disadvantage of requiring a protruding seal (included) to waterproof the headphone plug. For this reason, the iV6 case is best paired with H2O Audio’s Surge headphones (below) which provide waterproof protection to your iPod’s headphone plug. The Aquapac 104 case is probably the best of an adequate lot. We are generally leery of the “pouch style” cases because they have a way of opening accidentally (and, over time, developing tears ) but the 104 seal seemed pretty strong to us. The iTouch/iPhone itself is surprisingly easy to operate through the plastic. So what’s the catch? 1) An iPhone just barely fits inside the Aquapac 104 (you really have to jam it in) such that you can probably only put it in and take a out a few times before you risk damaging the case; and 2) the case provides minimal impact protection. The Otterbox iPod Touch Armor Case provides excellent shock protection and decent waterproofing (for depths up to 3 feet, 1 meter). However, it won’t fit the iPhone. And once you have the iTouch inside the case you can’t operate it! To change a song, or use an app, you literally have to remove the iTouch from the case. (On a personal note, we also aren’t big fans of how this case looks). The H2O Audio Amphibx Armband is excellent and would be our runaway winner if it weren’t for the undetachable armband. If you are swimming or doing something active then the armband is great (see our review below). If you want a case you can also use in everyday situations then you’ll find the entire Amphibx armband contraption very cumbersome to carry around. 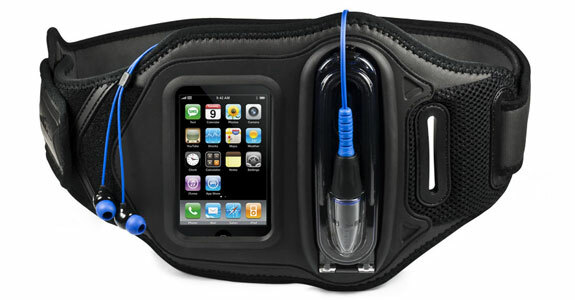 H2O Audio makes what are, by far, the best waterproof iPod armband-case combos. If you are going on a vacation that includes some time at a beach then the Amphibx is probably not for you—the armband portion of the case can’t be detached and you’ll find the Amphibx too bulky. 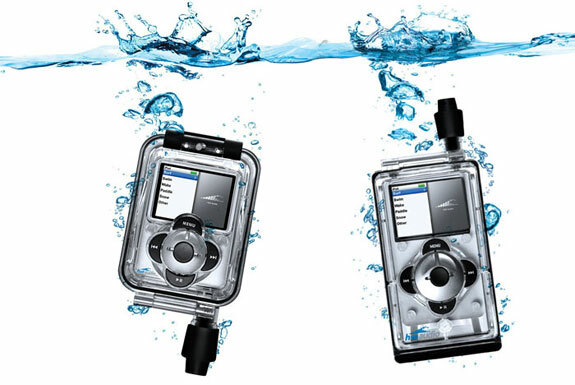 But if you are buying a case so you can listen to your iPod while swimming, surfing or doing some waterful activity then there’s nothing better than an H2O Amphibx (especially when combined with the Surge headphones, see below). This armband case is lightweight and comfortable to wear (on your arm or around your waist with the optional extension). The entire Amphibx floats in water, even when holding an iPhone. And you can easily operate an iPod while it is inside the case. Highly recommended! While most waterproof headphones struggle to produce a sound that’s the equivalent quality of an AM radio while underwater, the H2O Surge Bass Amplified Waterproof Headphones sound like a full FM channel. The Surge comes with five different earplug size adapters—it took us about 30 minutes (and a bathtub full of water) to determine the size that worked best for us. Once we did we found that the Surge ear buds did a wonderful job of sealing our inner ear from water. A carrying case is included. Note that the Surge headphones are different from the H2O Audio’s H3 waterproof headphones (which we do not recommend). These waterproof headphones cost 40% less than the Surge from H2O Audio (above). That is their only advantage; compared to the H2O model the Aquapac headphones don’t sound (or look) nearly as good. We think the extra cost of the H2O model is worth it but for those shopping on a tight budget Aquapac is the way to go. Not incidentally, if your iPod should accidentally get waterlogged the best remedy is to cover it in a bowl of dry, raw rice for 24 hours; rice absorbs water. But if you travel with your iPod in one of the above reviewed waterproof cases you can rest assured that your mp3 collection is protected from the elements—and can save your rice for dinner. I’ve always wanted to buy one for my iPod since I always bring it on my diving trips. I don’t worry about my GoPro because it’s waterproof but my iPod is one of my prized possessions and I want to keep it safe all them time. wonderful blog site. many thanks for this excellent publish. i love a lot. 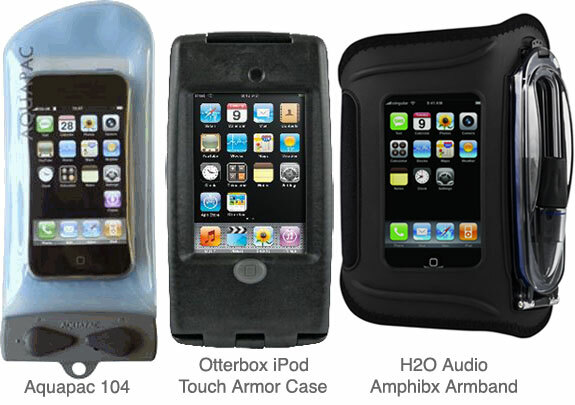 I just purchase the the H20 waterproof iPhone case … umm I mean the Amphix I think you call it . I LOVE it .. I got mine at http://www.drypodsonline.com they had a great price .. and someone that actually answered the phone to help me with the order. i have a ipod nano 6th generation new version. im tryin to find a water proff case that has a clip on the back if there is anything like this availibale please email me back. thanks. I have an iphone and wireless headphones (plantronics). Would the H2 Audio Amphibx work with them? I don’t need them for swimming but I’m trail running and there’s quite a few rivers and they’re guaranteed to get wet. I have a really old iPod Classic (like 2nd generation). I was wondering if the H2O Audio iV6 would work with that and if not can you recommend anything that would? the otterbox i have for my iphone 3gs works great! has saved my phone a million times over from my toddler who likes to chuck it in the dog bowl, sand at the beach, and daily tumbles…strongly recommend it! I fell in the salt water with my iphone in my pocket. I rinsed in in fresh water and put it into a bag with damp rid. within 3 days it was working again, it worked for about a year until last weekend when it fell off the side of the boat into about 3 feet of water. I am trying the damp rid again. Just got the iWP case from EWA-Marine, in Australia. Works great above the water, but the touchscreen is unusable underwater. I was able to kick off the video recording above the water and film underwater. There is no provision for headphone usage, which was fine with me. i have the H2O Audio Amphibx and the surge headphones for my iphone 3g. they are great for jogging or sports but…. when i use it in the pool than the fun ends. its perfectly waterproof but the pressure from the water screws up the iphone. the music stops when its emerged for more than about 30cm (i freedive so swim underwater a lot and bought it for my pool practise). Also its very clumsy to put teh iphone in the case and it wont stay in the right spot. I use a exces earbud to jam it in the correct spot inside the case. And when the iphone is in the case its almost impossible to use the home button because the edge of the case is in front of it. So its perfect for waterproofing your iphone but you cant use any of the controls while emerged and during emersion (like while swimming) the music stops and stutters. That is quite a list. The funny thing about this post is that I just bought a leather case for my iTouch today. It’s not waterproof, but then I don’t plan on taking it to the beach or pool or anything. What a terrific article! Thank you! I like the H2O Audio iN3 and H2O Audio iV6, where the iPod control buttons are replicated on the outside.